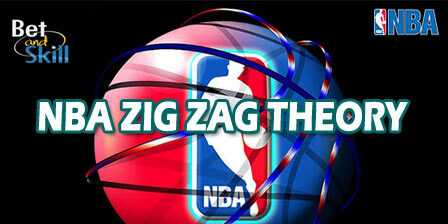 The Zig-Zag Theory is a simple betting strategy applicable on the NBA playoffs. This system supposes that with looming elimination, teams are more likely to ramp up their effort after a loss and win their following game. Let's see how accurate and profitable is the Zig-Zag NBA betting theory. The Zig-Zag Theory applies to NBA playoff series that follow the 2-2-1-1-1 format (which includes all NBA series except for the Finals which are 2-3-2). The NBA Zig-Zag Theory was created by well-known sports bettor Tony Salinas 35 years ago and the premise behind the system is to back the team that lost the last game in a NBA playoff series as, theorically, each match in the series is affected by the result of the match that preceded it. Over the last three years, the Zig-Zag theory turned a profit in the NBA Finals, for both ATS (at the spread, e.g. handicap betting) and on the money line (e.g. home/away). That’s especially true for home teams off a Game One home loss as they are 50-33-1 ATS (60.2%) in the last 5 years. Road teams that lose Game 1 win Game 2 only 31.5% of the time. If the road team wins Game 1, the home team is a very strong bet to bounce back, as historically home teams have won 76% of the time in that circumstance. When the higher-seeded team leads the series 2-0 and must go on the road, this is a great spot to bet the lower-seeded team that is now playing at home as these team gave a nearly 65% win percentage in the money line market and 68% in the ATS market. As you can see, the strength of NBA Zig-Zag theory appears to be in Game Two where it achieve a near 56% ATS winning percentage. As you can see, there is no much difference in terms of winning percentage when we look at the play-off rounds. The strategy is almost equally profitable in all the different rounds. Variations of the Zigzag theory have been used successfully for betting on the NFL and NHL playoffs. A Guide To Matched Betting: Earn Money With No Risk? "NBA Zig-Zag Theory: a winning NBA betting strategy"